Now Fairies are not really 'my thing', but I decided to join in a 'reverse fairy canvas' swap on Paperarts Yahoo Group. 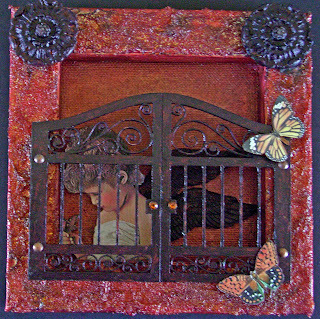 I made this one for me, because I had purchased these little gates a long time ago, loved them, but, never had the chance to use them. The decorations on top & the wings were made with great moulds I purchased from my favourite E Store, Wednesday Wishes. I like the result, let me know what you think. Beautiful art, Lucy. I love the moulds. Love it Lucy! The colours are just divine! This is stunning Lucy.... a beautiful gift for yourself!